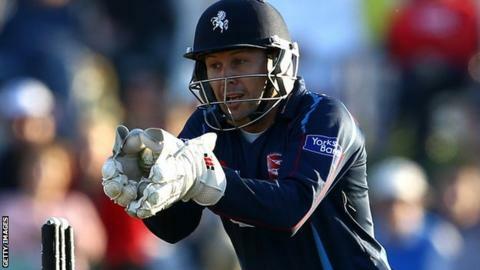 Former England wicketkeeper Geraint Jones has signed for Gloucestershire on a two-year contract. The 37-year-old spent 15 seasons with Kent but was released in the summer after being displaced by Sam Billings. Jones was loaned to Gloucestershire in May and scored 136 runs in three Division Two games, but his spell was cut short by an eye injury. He will now return to Bristol as a specialist batsman and captain in four-day cricket. "I'd like to thank Kent for the fantastic 15 seasons I spent with them," said Jones, who won the Ashes with England in 2005. "Following an enjoyable month with Gloucestershire during 2014, I am excited to be joining the club and for the challenges that lie ahead. "This is a young and talented squad and I relish the opportunity of working with them and to playing a part in their development." Jones takes on the captain's role from Australian opener Michael Klinger, who is returning to Gloucestershire for a third year but will not arrive until June - a month after the season starts. "We have spoken to Michael about that and he is comfortable with it," said director of cricket John Bracewell. "We intend using Geraint as a batsman and his presence on the field will be invaluable in offering advice and assistance to our young bowling attack." Jones has played in 34 Test matches and 49 One-Day Internationals, and has scored 8,615 first-class runs at an average of 32.5, with 15 centuries and 46 fifties. His wicketkeeping career has seen him take 586 catches and 36 stumpings in first-class cricket.